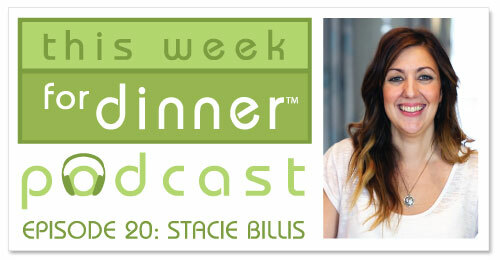 Today’s guest on the podcast is Stacie Billis. I recently met Stacie when I began writing for Cool Mom Eats. Stacie is my editor and we’re pretty much soulmates. Stacie has her own food blog called One Hungry Mama that is all about helping parents figure out how to feed their children wholesome food in a realistic way. In addition to her blog, she has a YouTube channel, is finishing up writing a cookbook, and has written for several great publications. Stacie has a background in developmental psychology and worked for Sesame Workshop and my conversation with her is super interesting. We talk about all kinds of stuff, including why Jim Henson was so wonderful and how Stacie’s work in children’s television evolved into food writing. Also, Stacie’s first cookbook Make It Easy: 120 Mix-and-Match Recipes to Cook from Scratch””with Store-Bought Shortcuts When You Need Them will be released May, 2016, so be on the look out! Stacie’s kitchen tip in this show is AWESOME, by the way, and I’ve used it many, many, many times since we recorded her interview a few months ago. You’re gonna have to listen to find out what it is! I can’t find the tomato article I read that I talk about in the show, but these two articles from The Kitchn and Serious Eats are close enough!